It’s difficult to say what kind of classic American convertible car we piled into as we departed Parque Central Hotel. In Cuba, the cars are a hodgepodge of parts from Japan, Russia, France or any other place that might have done business with them or where they could score. Cubans like to score and take score; every scrap and cent are accounted for. They are, in short, an industrious lot. Our driver, for example, was a trained and practicing urologist and gynecologist, but because the government only paid him $90 a month to be a doctor, he became a taxi driver, too. The car picked up speed as we took the Malecón to the Plaza de la Catedral. The Malecón’s eight kilometers of roadway stretch along the coast of Havana, and driving along it is a rite of passage. You feel like a vulture circling its prey, with so many deliciously decrepit sights, sounds and smells to devour in the throbbing heart of the city. We got fleeting views of alleyways littered with dismantled cobblestones, disenfranchised people, stray animals, clothing lines and power lines. Brawny buildings with undisclosed purposes meld colonial, baroque, neoclassical, art nouveau and art deco architecture as they stand shoulder to shoulder, together like a formidable military force. 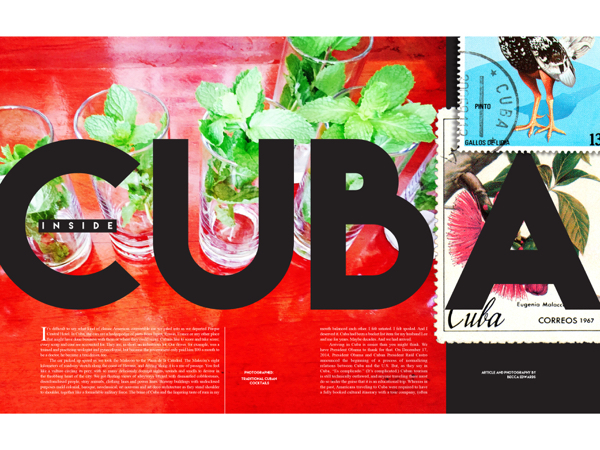 The brine of Cuba and the lingering taste of rum in my mouth balanced each other. I felt satiated. I felt spoiled. And I deserved it. Cuba had been a bucket list item for my husband Lee and me for years. Maybe decades. And we had arrived. Arriving in Cuba is easier than you might think. We have President Obama to thank for that. On December 17, 2014, President Obama and Cuban President Raúl Castro announced the beginning of a process of normalizing relations between Cuba and the U.S. But, as they say in Cuba, “Es complicado.” (It’s complicated.) Cuban tourism is still technically outlawed, and anyone traveling there must do so under the guise that it is an educational trip. Whereas in the past, Americans traveling to Cuba were required to have a fully booked cultural itinerary with a tour company, (often costing $2,000 to $3,500 per person, per week), now they must claim it is a people-to-people trip and reiterate that at every opportunity. 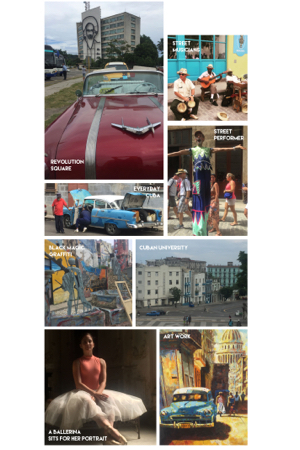 What is also complicated when traveling in Cuba is the public’s perception of Americans. At times, I felt welcomed. Others times I did not. My husband and I were traveling with 150 other Americans as part of a YPO (Young President’s Organization) trip. We were the largest American business group to visit Cuba since the embargo. It was obvious from the beginning that the hotel staff, our driver and our tour guides all wanted to impress us. But it was also apparent they wanted us to see Cuba through their lens. Before arriving in Cuba, the publisher of the Miami Herald, who is Cuban-American, warned our group that we would be monitored. “Don’t be surprised if your rooms are bugged,” she said. I didn’t take her seriously until an interesting event occurred. Our first night in the hotel, the thermostat, which was in Celsius, so I have no idea what the temperature was in Fahrenheit, was set low. Even though we were staying in a five-star hotel, it was five-star by Cuban standards, not American, and there was no blanket or comforter on the bed. We could not change the thermostat either. Like much of Cuba, it was controlled by some unknown entity. We froze that night, and in the morning, when my group all convened for breakfast, it became the talk at the table. People recounted comical stories of sleeping with their luggage on top of them and draping themselves with bath mats and towels. No one dared complain to hotel management because, in truth, we felt lucky to be in Cuba, and we got the impression that excessive AC was their way of trying to pamper us. (I mean fat Americans love their AC, right?) We joked about it all morning, and when we returned to our rooms later that day, the thermostat was magically set to a warmer temperature and a blanket was folded at the foot of the bed—in all 70-plus of our rooms. Another time, Lee and I departed from the group and decided to have a nightcap on the rooftop of our hotel. It was 11 p.m., and despite the 2.2 million people living in Havana, the city was silenced by the night sky. Occasionally, a vintage car would drive by, but no nightwalkers strolled the well-lit streets. It was eerily gorgeous. For a moment, we felt like the only people alive—and in Cuba nonetheless. We postulated that because of the Cuban work ethic, the history of human rights in the country, and the fact that the Cuban government seriously frowns upon drug use and public drunkenness, the fine people of Havana adhere to an understood curfew. We spoke freely as we sipped on Cuba libations, and just as we were about to kiss, we noticed two men in black outfits, one with a cell phone to his ear, standing on the neighboring rooftop. It was time to go to bed. One other time when Lee and I ventured off the grid, we saw yet another side of Cuba. Our group was supposed to tour the Universidad de Habana, but we were ready for an unchartered adventure. The university is set high in the city, with siren-song stone steps that lead to an underbelly world below; without hesitation, we took them. A churros peddler carted by. Street musicians played “Chan Chan” on a corner. Two men rolled dice on a foldout card table in an open-air building. We were in the thick of everyday Cuba. It was like being granted entrance into an elite club. Our excitement got the best of Lee, and he crossed a busy street without looking. “Cuidado, señor!” exclaimed a young Cuban man in an apron as he yanked Lee back from oncoming traffic. We giggled nervously and thanked him, which spawned a conversation and then a friendship. He was on his way to work as a chef in a restaurant and allowed us to walk with him. He showed us a street dedicated to Palo mayombe, or dark magic, with intricate graffiti and sacrificial vignettes. He introduced us to a local (as in that neighborhood) drink of rum, limón and ginger. And he spoke about his life as a Cuban. He worked hard—painfully hard—to support his wife and two children, and he was proud of it. He was a chef by trade, but also a skilled mechanic, because all Cubans apparently “need to know how to rebuild an engine.” Through thoughtful dialogue, we trekked successfully across the dry desert that is Cuban-American relations—a dialogue that may be silenced once again if President-elect Donald Trump proceeds with plans to reverse Obama’s “concessions” and cease Cuban-American trade and travel. In a must-read article by Uri Friedman in The Atlantic titled “What’s the Point of Isolating Cuba Again?”, Friedman quotes Obama and reminds us, “No repressive regime can move down a new path unless it has the choice of an open door.” With the passing of Fidel Castro, these words carry more weight for me now than when they were originally spoken. And so, I will leave you, dear reader, with one more anecdote from Cuba. On my last full day in this enigmatic and impressive country, I had the privilege to not only meet Alex Castro, Fidel’s son and personal photographer, but to spend the day with him on a photoshoot with the top two dancers of the Ballet Nacional de Cuba in a historic mansion that quite literary froze in time when Castro took power in 1959. (Side note: Here and there, you hear guarded stories about the displaced people of Cuba. One account was of a wealthy family who fled from Cuba during the beginning of the communist regime and left the house to the maid in hopes of one day returning. That was over 50 years ago, and now her son is raising his family there, amongst priceless art, fine silver and estate jewelry he never earned or wanted.) As Alex gave me photography instruction, I felt conflicted between the raw awesomeness of being able to jump on antique furniture with him and capture the angle and light just right to get a stellar photo, and the inevitably sad story of the homeowner who once owned this magnificent home. It truly was “complicado,” and I realized that not even Fidel’s son had totally chosen or predicted to be in this moment. Before meeting Alex, we were warned not to ask about his father, but because I failed to develop an adult filter and somehow in that day established a kinship with Alex, I turned to him and said, “You know, you look like someone famous.” Alex, who is shy and quiet by nature, smiled and said, “I get that a lot.” Our exchange was indicative of Cuba—in so many ways and on so many levels. Did you know that for decades in the cigar factories, where generations continue to slap pelts of tobacco leaves on their thighs, roll and cut with utmost precision, and stain their hands with their trade, a woman comes on the loudspeaker every day? In the morning, she reads the news—however controlled—to the workers. In the afternoon, she reads excerpts from classic literature. Some of these people can barely read, but they know Shakespeare by heart. Heart. The Spanish word for heart is corazón and the corazón of Cuba thrums and thrives today. As it has. As it always will.